Melt butter in a heavy skillet over medium heat. Add celery and green pepper and saute until vegetables are soft but not brown. Beat eggs with cream or half-and-half and stir in rice. Lower heat under the skillet and pour egg mixture over vegetables. Cook, stirring, until eggs are set, about 3 to 4 minutes. Season with salt and pepper. Classic recipe from the December 1986 issue of Working Mother Magazine. 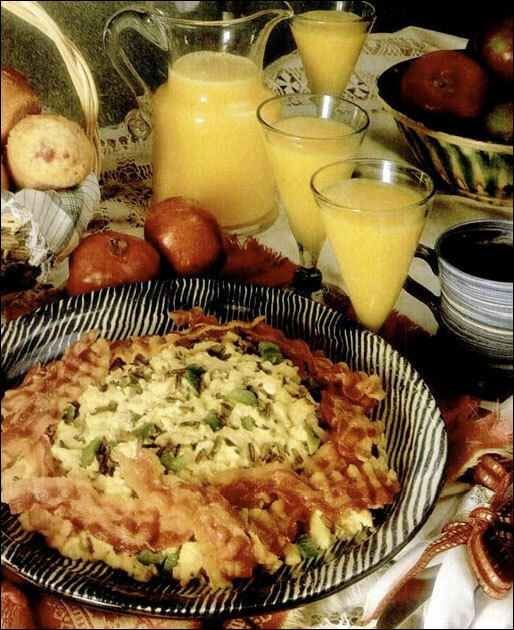 According to the article "A Very Merry Christmas Breakfast" by Thomas Head, "Wild rice is expensive in quantity, but a mere half cup provides the distinctive crunchy texture and nutty flavor that lifts this scrambled egg dish out of the ordinary." Recipe number 2946. Submitted 10/26/2010.